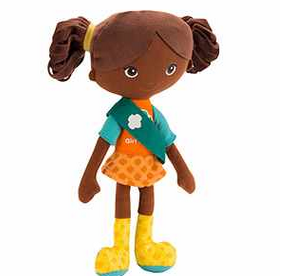 * Dons a bright orange and teal Girl Scout knit tee, an orange velour skirt decorated with the Girl Scout Trefoil design and vivid yellow vinyl boots that feature Trefoil emblems and teal corduroy fabric soles. 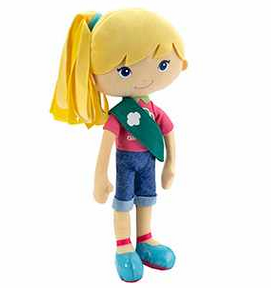 My boys are in Cub Scouts and absolutely LOVE it. I love the values they learn...we use the motto in every day life "Do Your Best" that's all you can ask of people, right? They are hoping for a Cub Scout "doll" (they claimed they would rather see some of the mascots like the tiger and wolf) to come out soon! 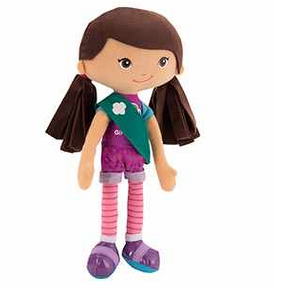 You can purchase the GIrl Scouts Friendship Dolls at Wal-Mart stores nationwide and online at Girlscoutshop.com, Walmart.com and YOTTOY.com.